Boon Island Lighthouse rises 133 feet above its namesake island, located several miles east of York. The tower flashes a white light every five seconds; when weather conditions are right, the fog horn sounds 10 seconds. The lighthouse is licensed to the American Lighthouse Foundation. YORK, Maine — Online bidding is now open to buy Boon Island Light off the coast of York, according to the U.S. General Services Administration. Halfway Rock Light Station off Harpswell is also available for sale. Bids start at an opening deposit of $5,000, with no bidders as of midday Friday, according to the GSA’s website, www.realestatesales.gov. The General Services Administration is the real estate arm of the federal government. In December, GSA spokesman Patrick Sclafani said Boon Island Light would be sold to the highest bidder in the spring as no historic preservation or nonprofit organization had stepped forward to become stewards. The town of York owns Nubble Light, but the Board of Selectmen expressed no interest in taking on the more remote Boon Island when it learned the U.S Coast Guard was selling the island and light tower. 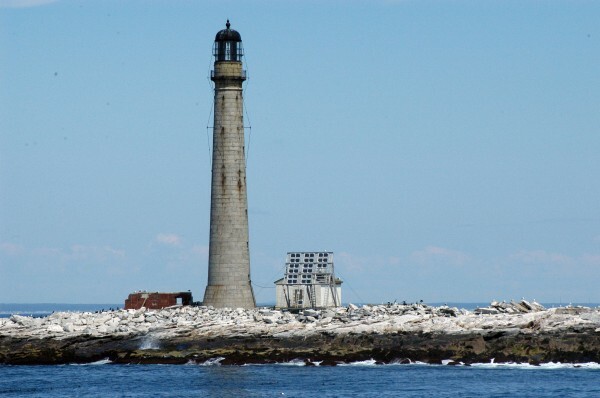 Any individual can now own the historic lighthouse and small island six miles off the coast of York. Restrictions apply. The owner must continue to have the property serve as a navigational aid maintained by the United States Coast Guard, according to the GSA. The islet is a barren outcrop of granite 14 feet above sea level, according to the GSA. In December 1710, the Nottingham Galley was shipwrecked at Boon Island prior to the lighthouse being built. The crew resorted to cannibalism to survive. Boon Island Light Station has a 133-foot tapered tower composed of ashlar granite, punctuated by two vertical rows of seven windows, according to the GSA. The interior of the tower contains a circular stairway that leads to a door at the parapet. A tall granite shaft holds the lantern, it states. There is a small shed on the site which may be a remnant of a boathouse; the ruins of the former keeper’s house are visible, it said. The lighthouse was automated after the blizzard of February 1978. Its original Fresnel lens, installed in 1855, is now on display at the Kittery Historical and Naval Museum. Halfway Rock Light Station was constructed in 1871 and is so named because it can be found halfway between Cape Elizabeth and Cape Small, approximately 10 miles east of the more famous Portland Head Light. The Harpswell island light is a granite tower 76 feet tall with an iron dome-shaped roof for the lantern room, according to the GSA website. The property, on a two-acre rock ledge off Harpswell’s Bailey Island, also includes a wooden boathouse and boat ramp in disrepair. The U.S. Coast Guard each year makes available an estimated five lighthouses in New England and the Great Lakes, according to Sclafani.